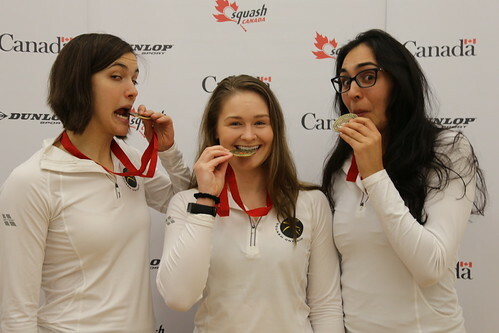 Strengthened by Canada's top two ranked players, Team Ontario, stepped onto the courts of the Windsor Squash & Fitness Club as the heavy favourites. Going 4-0 in round robin play, Ontario would come out on top of Pool A, and was set to meet the winner of Pool B for the championship title. Alberta, led by Danielle Letourneau, would go 3-0 in Pool B, securing their spot in the finals for a second year in a row. On the men's side, it was a battle right to the end. After taking a match up each, the finals would come down to the final match up. “I didn’t really know what was going on [next court], other than Shawn was ahead, “said Jason De Lierre as his swing match was likely to be the deciding match against Team Alberta. “I try not to think about that. I focused on my strategy, keep it simple, take the ball to the back, stay consistent, no easy points." When his brother stepped on the court for the fourth game in his championship-determining match, Shawn De Lierre, Canada's top-ranked male and veteran athlete, had just finished his match against Alberta's Andrew Schnell, and was courtside waiting to see if his Team Championship reign would continue. De Lierre versus Schnell is a battle Canadian fans have seen before, and like their two previous faceoffs - the 2015 Canadian Open Championships and the 2016 Canadian Open Championships - this was an epic battle of Canadian talent. Having split their two previous Championship matches, De Lierre taking the national title in 2015 and Schnell capturing it in 2016 - this match was anyones taking. Neither let the other runaway with it, each point was fought and earned, and in the end, De Lierre took the match and waited on his brother for the final result. “There is an angel over me,” expressed Shawn De Lierre, the #1 for Quebec. “For some reason, every time I play in the Team Championships.” This marks Shawn’s 9th team title - the most for any player in Canadian history. Get caught up on the action in photos! Visit Squash Canada's photo gallery for the weekend's best shots.